This week's lesson is about Solomon and his request to God. God was happy with Solomon's choice and blessed him with wisdom and riches. Today's project will review the facts for Solomon. Review: We studied David last week. David was a shepherd for his father Jesse. David took food to his 3 oldest brothers, who were soldiers in King Saul's army. While David was visiting the camp, he fought the Giant Goliath. David was best friends with King Saul’s son, Jonathan. 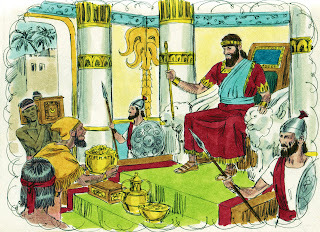 David was a good king for 40 years and today we are learning about one of his sons named Solomon. Most of today's lesson is found in 1 Kings 3-5. David made his son Solomon the next king before he died. And Solomon loved God. God appeared to Solomon in a dream and asked him “What can I give you?” Solomon said that there were so many people for him to rule over and he would like to have an understanding heart, to know right from wrong so he could judge God’s people. God was happy with Solomon’s choice. Solomon didn’t ask for a longer life, more riches, but he asked to have the knowledge to decide fairness for the people. God told Solomon that He will give Solomon what he requested. God told Solomon that He would give Solomon a sympathetic heart and Solomon would be a very wise man. God also told Solomon that there wasn't ever any man like Solomon before and there wouldn't ever be anyone like him again! But, God then told Solomon that He would give Solomon the things he didn't ask God for, like wealth and the people's respect. If Solomon followed God's ways and kept His commandments, then God would give Solomon a long life. 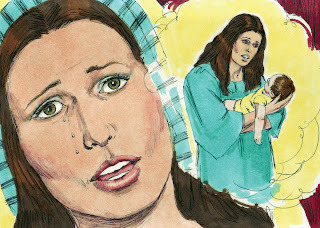 The next day, two women went to King Solomon with a problem. They told him that they lived in the same house and they both had a baby. There wasn’t anyone else home at the time. One of the babies had died because the mother laid on him during the night. So she traded babies in the middle of the night. When the other mother woke in the morning to feed her son, she saw he was dead and when she examined him, she knew he was not her baby. 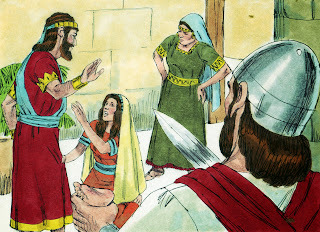 Then the women argued about who had the live son and now they want Solomon to help them. 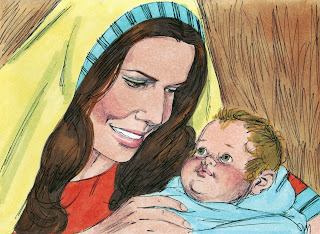 Solomon told his men to give the first mother this baby because she is his mother. Everyone heard about the wisdom of King Solomon. 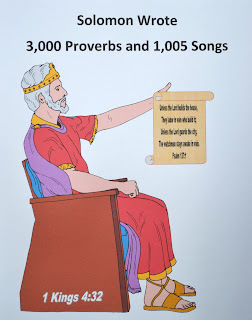 Solomon wrote 3,000 proverbs and 1,005 songs. Click here to download the visual.. I printed the first page of this project on colored cardstock. Then, I used a craft knife to cut a slit along the treasure chest, just below the coins. I cut cardstock into fourths and glued it to the back of the treasure chest making a pocket so the kids could tuck the gems of Solomon into the treasure chest. As I told the lesson, they filled in the blanks and added the gem to their treasure chest. There are 15 fill in the blank questions which I printed onto gold paper. I also wanted to make clear that Solomon wasn't just wealthy because he had a lot of money & jewels. He was wealthy in wisdom, and his belief in God. Click here to print it. 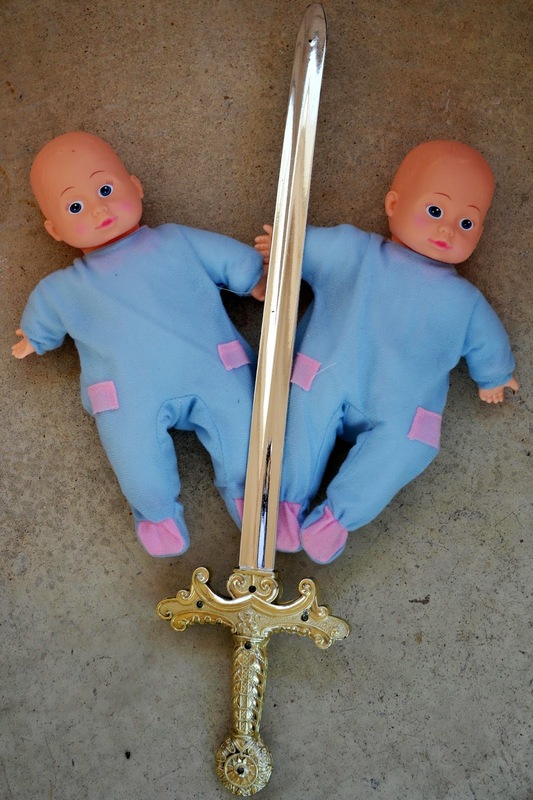 For the visual this week, I place the two baby boys (Dollar Tree) in the center of the table with the sword between them. I can take away one during the lesson, and hold one during the last part. Click here to download the Bible verse. Okay, but why not use the examples suggested, and read the text out of the bible--that's where the power is! great content! Can you tell me how I can get access to downloading the beautiful story pictures? Chris, you can download them @ https://drive.google.com/file/d/1ep3DH26I6KLrmhEm7soGLdkUvhLM2F8q/view?usp=sharing and the link to download the same pictures, but black & white is found towards the end of the post.